This fish recipe, inspired by Shauna Ahern’s story in this issue (page 85), can also be made with pork or boneless, skinless chicken breasts. Preheat the oven to 350°F. In a large bowl, combine the 3 tablespoons olive oil, salt, Dijon mustard, and pepper. Add the halibut, coat evenly, and marinate for 5 minutes. Remove the halibut from the marinade and dredge each fillet in sweet rice flour. Heat a large sauté pan over medium-high heat. Add the 4 teaspoons olive oil. When the oil is very hot, sear the fish on all sides, about 6 to 8 minutes total, then put the pan and fish, skin-side down, in the oven, and finish cooking, about 5 minutes. Transfer to a plate and reserve. Meanwhile, cook the green beans in boiling water until al dente, about 2 to 4 minutes. Carefully wipe the pan clean with a paper towel and return it to the stovetop over medium-high heat. Add the butter and hazelnuts. When the butter turns chestnut brown, about 3 to 5 minutes, add the lemon juice. Add the green beans and toss to coat. 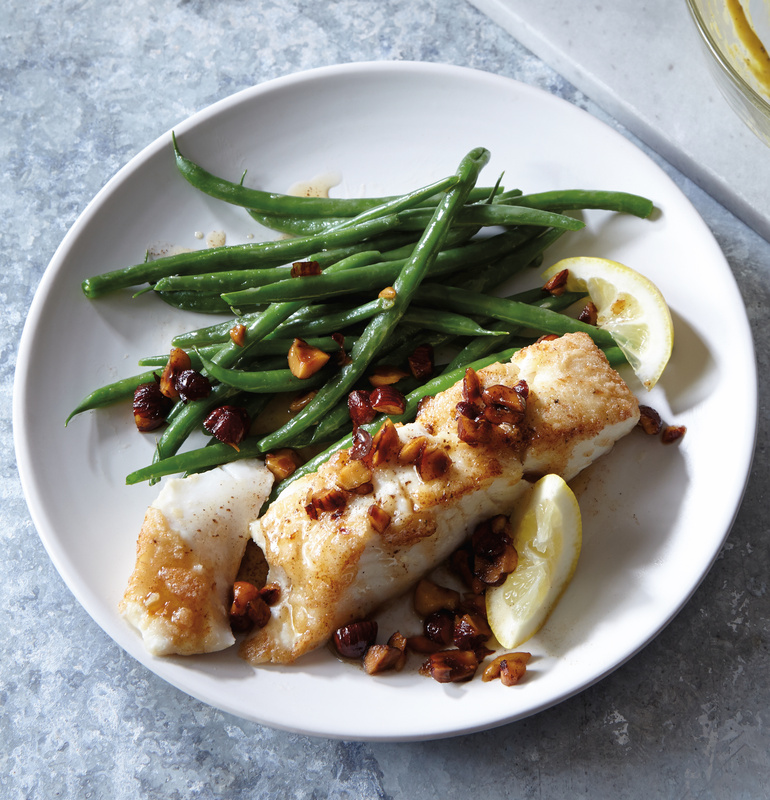 Divide the fish and green beans among 4 dinner plates, drizzle the brown butter and hazelnuts on top, garnish each with a lemon wedge, and serve.